A city hotel, “The Residence Rajtaevee” is centrally located between Pratunam (Watergate) and Rajtaevee intersection. The Residence Rajtaevee is adjacent to Siam Paragon – Bangkok’s recent most notable shopping and entertainment complex. Apart from its varieties of world’s top brand names, guests can take BTS Mass Transit Railway (Siam station) to other attractions in no time. 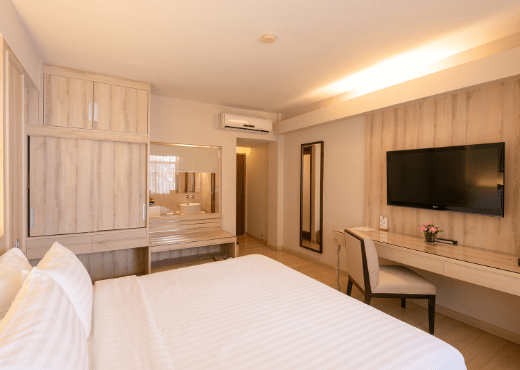 Within walking distance, The Residence Rajtaevee is surrounded by all of Bangkok’s most fabulous shopping and entertainment centres while easily connected to all major central business district. Though The Residence Rajtaevee is next to the busy main street, guests will still get extreme privacy and peaceful in our specially designed tropical resort atmosphere. Facilities for guests’ comfort ranged from in-room to public area are also not to be compromised. Guests will also enjoy excellent cuisines from our famous buffet breakfast to varieties of international dishes.